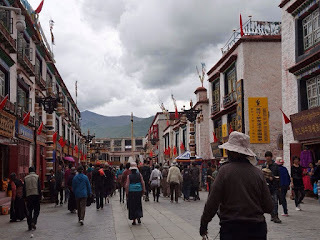 Lhasa, a mysterious and beautiful place, is famous travel desination of historical interest related with Buddhism, such as Potala Palace, Jokhang Temple, Drepung Monastery, Sera Monastery, etc. Tibetan ethnic group make a great contribution with its long history and rich culture. And one of them is Tibetan fresco which is an important component of Tibetan culture. Tibetan ethnic group is also featured by its special lifestyle and habits. The word Lhasa, meaning “the Sacred Land” or “Buddha place” in the Tibetan language, has been the cultural, economic, political and religious center in Tibet since ancient time. Tibet was a theocratic state and Potala Palace was the symbol of the supreme theocratic regime in old days. However, with the peaceful liberation of Tibet on May 23, 1951, theocratic regime went to its doom and Lhasa entered a new era. In 1960, State Council officially approved Lhasa for the prefecture-level city. In 1982 Lhasa was selected as one of the state level historical and cultural cities. With a history of more than 1300 years, Lhasa is the cultural, economic, political and transport center of the region. In the seventh century, Songtsen Gampo moved capital to Lhasa and established the powerful Tubo Kingdom after unifying the whole of Tibet. And then Tibetans set about building Great Brightness Temple and Little Brightness Temple. After completion of these two temples, monks and pilgrims gradually came to Lhasa. 18 hospices had been put up by the 640’s near Great Brightness Temple for pilgrim from afar and the houses of many local residents had risen nearby, forming the beginning of the old quarter of the Lhasa centering around what is now know as the Octogon Street. Meanwhile Songtsen Gampo built an extension onto his palace, i.e. Potala Palace. Potala Palace is the most representative attraction in Lhasa so that it is must-see. Tickets for the Potala Palace are limited. Take your passport and head to the southwest exit and look for ticket stand where you will get a free ticket voucher. The following day, arrive at the south entrance 30 minutes before the time on the voucher. After checking, you are allowed to enter the palace for one hour’s visit. Besides the famous Jokhang and Ramoche temples, there are many other unknown temples which are mostly worshiped by locals. These small temples are free of charge. The Buddhist statues and murals in these temples are worthwhile to watch. Another impressive activity is Scripture debate in Sera Monastery. The debate is so famous that the scenes of the debate are printed on the tickets. Even if you have witnessed the debate in other temples, the debate in Sera Monastery should not be missed. What’s more, there’s a pure beautiful lake about 112km away from Lhasa, Namtso Lake. The lake is crystal-clear blue and the degree of blue are changeable as weather, position and seasons change. You will be lost in the blue world! One more thing you are worth doing in Lhasa is to take a sunbath. The city enjoys over 3000 hours of sunlight annually. You can totally find a good spot and relax under the sun, but don’t forget to smear sunblock. Lhasa is opening for travelers all the year round. But the best time to visit Lhasa is from August to October. The climate during this period is humid and warm compared with dry and windy weather in spring and winter. When going to Lhasa in summer, you can pay a visit to some magnificent monasteries such as Drepung Monasteries and Jokhang Monastery. In the evening, you can relax in the Tibetan-styled bars and immerse yourself in the Tibetan atmosphere. Although it is rainy season in summer, your journey will not be affected, because it always rains at night and clears up on the following day. If you visit Lhasa during Shoton Festival in August by chance, you can not only watch the performance of Tibetan Opera but also witness the magnificent scene of an exhibition of precious Thangka in Drepung Monastery. As the old saying goes in China, food is the paramount necessity of the people, Lhasa also provides the best food to people's taste. The food can be divided into Tibetan food, Sichuan cuisine and west-style cuisine. Nepalese and Indian food in some restaurants are also available. The flavor of Tibetan food is light and not greasy. Any spicy ingredients are not added to the food except garlic and green onions. Visitors can have a taste of local Tibetan cuisine such as Yak beef, buttered tea, and Tsampa, etc. Lhasa has some food streets which you can taste authentic Tibetan food. Deji Road which contains about 100 restaurants is the most popular dining place among locals. Western-style restaurants can be found in Beijing Road and Barkhor Street, where you can also shop for some Tibetan artifacts. What do you waiting for? Come and join us for a wonderful Lhasa tour!